Whiskey ice cubes are small stones, which you can keep in your freezer, and put in your whiskey or other drinks instead of using ice cubes. The biggest advantage to use stainless steel chilling reusable ice cubes, is to have your drink not diluted by the traditional ice cubes. 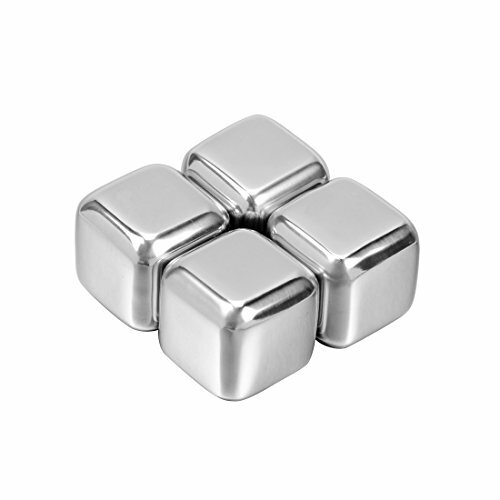 Our square stainless steel Whiskey stones is one of the best in the market. It contains a non-toxic gel inside each cube, which will keep the drink extra cold. You usually only need to freeze these cubes for 2-3 hours, and then you can toss them into your beer, red wine, beverage or whiskey, enjoy the non-diluted cooling. These Whiskey stones are very durable, reusable and easy to wash and clean. 4. Add a serving of your favorite liquor or other beverage. 6. Several minutes later, you will enjoy your favorite beverage. Do not swallow and eat them. Keep it away from your kids! Not for lager glasses or tall drinks. They will not get your drink as cold as ice, but sure do not dilute your drink. Package: 4pcs stainless steel chilling reusable ice cubes. Food-grade stainless steel whiskey stones chilling your drinks without dilution.The square stones, designed to prevent swallowing. Made from stainless steel, durable, reusable, easy to wash and clean. Whiskey stones is unique gift for spirit drinkers, best reusable ice cube for whiskey and beer. Stainless steel whiskey stones freeze 2-3 hours and ready to go, great for whiskey, vodka, liqueurs, wine, coffee, juice and more. Food-grade Non corrosive stainless steel whiskey stones is odorless and non porous, so it will not affect your drink's flavor. If you have any questions about this product by Haomacro, contact us by completing and submitting the form below. If you are looking for a specif part number, please include it with your message.